It's been a productive year already and I expect there will be much more fun to share in the coming months. This month I share a project that is "hot off the press:"
I'm most proud of the design work that leads to greater things for others and Onsite continues that mission in bigger ways each year. 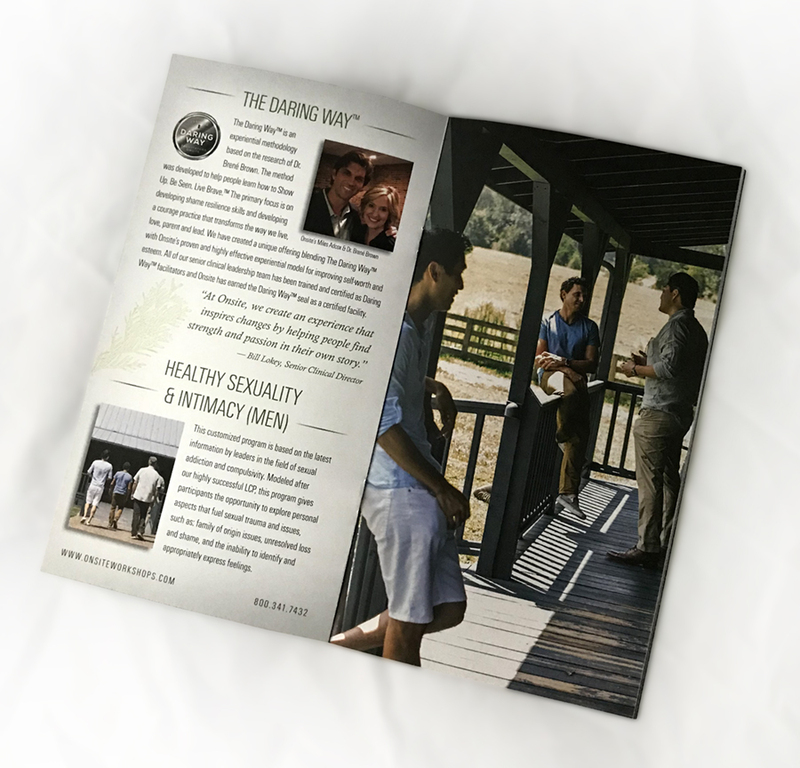 My tool box is art direction, design and illustration; their mission is to transform lives in ways that help others through therapeutic and personal wellness workshops—all in an idyllic rural Tennessee setting. Their reputation spreads far and wide—both nationally and internationally. CEO Miles Adcox has been featured as a guest expert on many familiar channels and Onsite has been featured on 20/20, Good Morning America, The New York Times, and The Wall Street Journal. Dr. Brené Brown endorses their stature in the personal wellness realms. 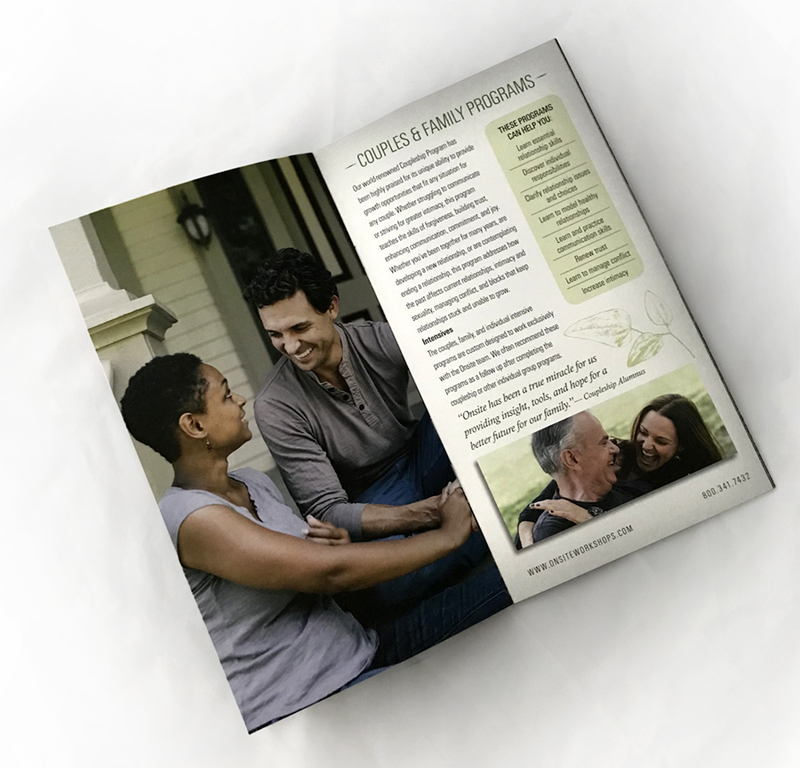 It is such a great and lofty endeavor to be a part of: to call people to their best selves through the design of a brand and brochure. 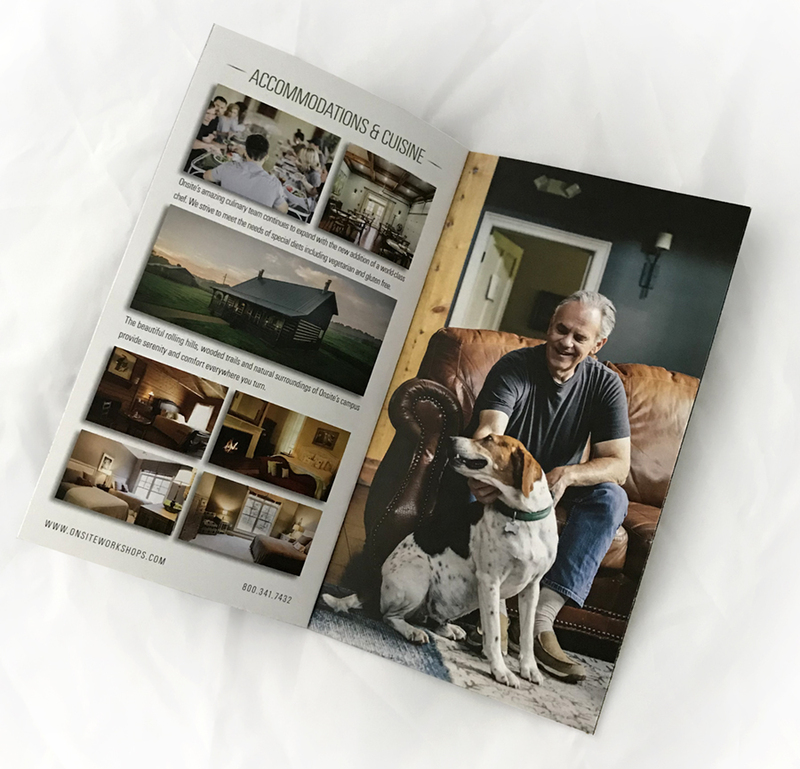 While I truly appreciate the process of reinvention, the subtle restraint and refinement of a brochure's design that already worked well in the past can be just as fulfilling creatively. This year's design is similar to last year's but with more beautiful new photography (thank you, Daniel C. White!) which gives Onsite's only printed annual promotion a fresh new feel. But that doesn't mean we skimped on the process. 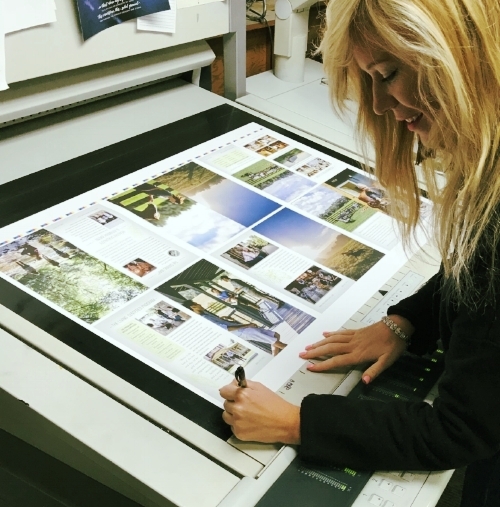 The photo shoot was just the beginning of a long process of refining copy, layout, photo positioning and the ever-tenacious but necessary process of proofing, ultimately to go to the printing press and the mail house. If ever given the opportunity to tour a large offset printer's facilities, even if you've seen this process before, I recommend it. The presses are huge monsters, some bigger that mobile homes. To see it in action is a sight. 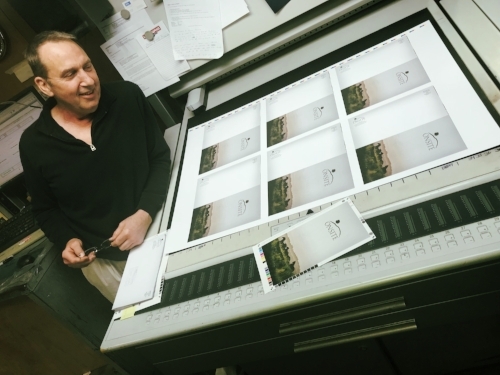 Proofing the sheets coming off the presses under color-calibrated lighting and using digital technology for precise color accuracy on a paper stock that is also calibrated to a precise whiteness—well, let's just say it's not just the design and branding that makes a piece succeed, it's also an artful and scientific approach with vendors and products. Having a great paper resource (Athens Paper, thank you! ), an awesome printer rep who not only understands the process beginning to end but also the project's objectives (Twyla Clark, thank you! ), experienced pressmen and bindery (Lithographics, thank you! ), then finishing all of that with a great mail house (DNI Corp, thank you! )—all of these things are necessary ingredients for a finished piece meant to impress. Working with people who have had relationships that span the length of long and fruitful careers help make a process flow with ease. We are most of all thankful to Onsite—we love what we do because of the incredible things that you do.